Can you give some tips on how to read the report? 1. You will see a date line in the center of each set of your daily planetary aspects. 2. The more the build-up of good transit activity above the line, the better the chances of a larger win. Good effects tend to release after a final bad transit moves out of range. 3. The term "Beak shape" has been used as it looks similar to a breaking wave or bird's beak when represented graphically, using arcs to depict the planet orbs. However, because of the textual nature of the report, transits are represented on a flat per-line basis, hence they don't look too much like "beaks" when viewed as text. 4. You will notice that at the bottom of each column, there are usually days showing "$$$" signs indicating the most likely Lucky Days, followed by the word "Lucky". Please interpret this to mean that the day pointed to by the dollar signs is the recommended lucky day. However, sometimes the luck occurs on the following day, on approximately a 2 degree orb, as opposed to a 1 degree orb. This is because sometimes the last bad transit (shown below the date line) might take a little longer to release. The program uses a 1 degree orb as default, with 2 degrees for Venus when aspecting most of the outer planets, as I have noticed that Venus tends to pay on the 2 degree separating orb more often. 5. The Lucky Day should be the date of the draw, race or game on which you are betting. It does not seem to matter when you purchase your ticket. The reason I say this is because I tried to exploit it, with no success. I looked ahead for days with auspicious charts and for times when those good aspects would best align with themselves, the angles of the daily chart as well as my own chart, purchased the tickets to the minute. Failed time and again trying this method, yet at the same time noticing the recurring pattern of myself and others winning during the period 24-48 hours after a last bad transit ends. 6. When trading on the Stock Market or Foreign Exchange, there are two options you can follow. If you know the date on which you will sell or cash in on your investments, then try to ensure that that day is a Lucky Day. If however, you do not know when you will be cashing in on them, make sure that you purchase them at a time when there are as many good aspects above the line as possible, preferably with planets like Jupiter, Venus and Saturn involved. If at all possible, try and set your purchasing and selling dates both under the best and maximum number of good transits possible. At these times, rest assured that natural laws and influences will generally help you to make the right decisions. 7. There is usually only one payout per beak. 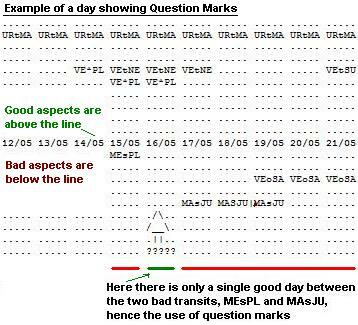 This means that, if you win on the day marked with the arrow, you should try not to gamble on the following day. You will normally lose on this day. But if you do not win on the "arrow" day, then it is still possible that you will win on the following day, marked in text as "Lucky". You should really only consider gambling on the few days following a beak if there are several good aspects and you have a close, beneficial progressed aspect in operation at this time. 8. 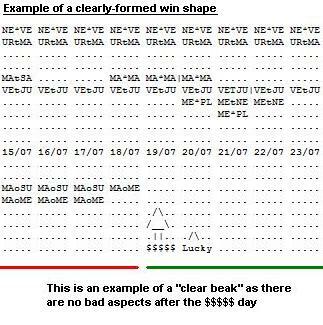 Wins tend to occur more under a "clear" beak day. This means that there should be a period of no bad transit activity for several days after the recommended $$$-day and the word "Lucky". If there is another bad transit fairly soon after the beak, please treat the beak with caution. If the next bad transit occurs as soon as 2 days later, you will see that the beak has been indicated with a series of question marks, and should be treated with the most caution. These questionable beaks do sometimes pay, but what is happening here very often is that you have a square in your natal chart that is separated by a few degrees. Hence a bad transit releases from the first natal planet, followed by a break of a day or so, only to be followed by a second bad transit. In effect, if the orb allowance was extended to 2 degrees, this period would not indicate a beak at all, and that is why you should take care when gambling on 'questionable days', since the transits are merely letting up temporarily in the middle of the two aspects. 9. Please do not get disheartened if a few don't pay. General feedback from users is that over 60 percent of them pay (the clear ones), and when they do pay, they normally pay very well and easily cover other losses if you bet in a uniform and disciplined manner. 10. Remember, you don't have to spend a lot to win a lot. While researching this concept, very often I would spend fairly large amounts of money for days in a row before the lucky day (I was an habitual gambler before I found out how best to apply the concept), and then on lucky day, with my funds almost exhausted, would gamble a fraction of what I had previously spent, only to suddenly receive a handsome payout for a relatively small wager. I now only play on the recommended "$$$" day, and sometimes again on the day afterwards if it does not pay. This is a big advantage on its own. After checking my records of the dates of wins over many years (including dates of wins and losses I had before discovering astrology for myself), I have found that, in over 95 percent of the cases, I never made any money when a bad transit was in operation to Mercury, Venus, Mars or Saturn. If I ever did, it was on the outer limits of the bad transit orb. So, the program can save you a lot of money very often, as well as pay fairly often when you do play. 11. A concise key is printed at the end of each report, which can be used to look for favorable times to do many other things. For example, when planning a presentation, interview, exam or similar, look for good aspects to or from Mercury, Saturn, the Sun, Jupiter etc. When planning a vacation, look for a period of much good transit activity, especially with Venus. When planning for romance, pleasure or beautiful events, look for good aspects involving Venus, Mars and Mercury. Venus and Mars in aspect can often bring intense physical romance. Uranus and Venus in aspect can bring some very exciting times (you won't ever forget them!). Don't engage in reckless activities when Uranus and Mars or Mercury are conjunct, squared or opposed. Ask for a promotion or purchase properties or investments when Saturn and/or Jupiter are involved in good aspects. Things like that. By getting in sync with your transits you can maximise the good times and slow down or be careful during the difficult times. 12. Try using the Internet to give you a more complete description of a particular aspect. For example, if the program indicates an aspect of "JUtSU", go to Google or similar and type in the full aspect in quotes. In the search box, in quotes, type the full name of the first planet, then the aspect name, followed by the full name of the second planet. In this case, you would type in "Jupiter trine Sun". The search engine will retrieve a whole lot of references to any aspect you type in, and you can click on a couple to learn more about how the aspect influences you. Stay disciplined, never "chase" a loss by trying to cover with a larger bet. You will normally lose if you do, and this is the primary cause of "addiction", people spending more money to try and recover the amount already lost. Bide your time, be patient. Because transits fire off the much bigger progressions in your life, you will occasionally receive a very nice payout on a lucky day or other well-aspected day for seemingly little transit activity, perhaps one day a huge payout if you have a fortunate natal aspect that has moved to within a 1 degree orb by progression. A very good general rule regarding your finances is as follows: Months showing a lot of good Venus transits above the date line are usually months where you have extra money, and are good months to focus on for gambling or speculating. Months where you have relatively few good Venus transits above the date line or a number of bad Venus transits below the line are generally periods when you could be short of money, lose money, or be more prone to making poor financial or investment decisions. I am a member and need to reinstall my program. Can you tell me what to do? Download the program again from here. Then login here to get a valid Registration (unlock) code. Where can I find the Longitude of a city?